I’m delighted that Patricia Bracewell has agreed to share her sources of inspiration with me. 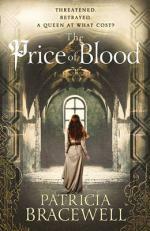 And I’m doubly pleased to say that her new book, The Price of Blood, has reached Australian shores! 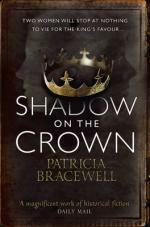 In celebration of the launch, Patricia has kindly offered giveaway copies of Shadow on the Crown and The Price of Blood. Be sure to comment to go into the draw to win both. Entries close 13 March, 2015. 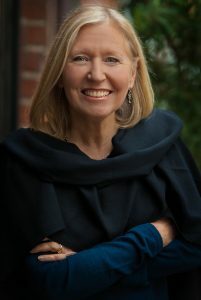 You can learn more about Patricia and her books on her website, and she would love to connect with you via Facebook and Twitter. Patricia’s love of stories led to degrees in Literature, a brief career as a high school English teacher, and an unquenchable desire to write. She experimented with personal essays and short stories before turning her attention to the novel. Shadow on the Crown, the first book in her trilogy about an 11th century queen of England, was published in 2013, and has been translated into Italian, German and Russian. Her second novel, The Price of Blood, continues the gripping tale of Emma of Normandy, whose marriage to an English king set in motion a series of events that would culminate in the Norman conquest of England. Patricia recently spent two weeks in Wales where she was honored to serve as Writer-in-Residence at Gladstone’s Library. She has two sons and lives with her husband in Oakland, California. Looking back on it from a vast distance, I would have to give the credit to Louisa May Alcott. My childhood copy of Little Women was dog-eared from many readings, and from the time that I was quite young I could envision myself as Jo March, scribbling away in a garret. It would be a long time before I understood what a hard life Louisa Alcott had and how difficult it is to write a really good book. My current book, The Price of Blood, is the second novel in my trilogy that began with the 2013 publication of Shadow on the Crown. The central character of both books, Emma of Normandy, has been my inspiration since I first read about the historical Queen Emma in the late 1990’s. Few people recognize her name today, but Emma was a queen/consort of England for 32 years in the early 11th century. Even the briefest details of her life – that she was wed to two kings of England, mother of two kings of England, and daughter of the Duke of Normandy – were enough to convince me that this was a woman who must have lived a remarkable life. I wanted to imagine what her world was like and resurrect her from the footnotes of history. There are two themes, actually. The first is motherhood because early historians had accused Emma – wrongly, I believe – of being an uncaring mother. I hope that I’ve portrayed some of the difficult decisions she must have been forced to make in order to protect her children in a very difficult and cruel environment. The second theme is the acquisition of power by a woman in a world ruled by the sword. There were women of power in that world, yet anyone reading 11th century annals might imagine that women did not exist at all because they were so rarely mentioned. I wanted to write about women’s power and what that might have looked like. I am fascinated by the early medieval period in England, particularly the culture of the Anglo-Saxons. In my teens I was drawn to Tolkien’s Lord of the Rings, much of which is rooted in that Anglo-Saxon culture. It was a time of great turmoil, of cruelty, of religious fervor, of war and catastrophe and heroism. In some ways, it was not unlike today. I find it comforting that the human race survived all of that. It gives me hope for the future. I turn to books first: histories, biographies, journal articles, as well as ancient annals dating back to the 11th century. Classes have been a great resource: I took a summer course at Cambridge that covered the Anglo-Saxon period, and every May I attend the International Congress on Medieval Studies at the University of Michigan where I’ve listened to papers on everything from brewing ale to women travellers in Anglo-Saxon England. I also believe in a ‘boots on the ground’ approach, so I’ve visited sites in Normandy and Denmark, and I’ve been to England many times to get a feel for the places that appear in my novels. I use the internet to look at maps and determine distances between towns because working out how long it might take my characters to travel from one place to another is always a thorny problem. Experts are also a valuable resource. I’ve consulted swordsmen, horsewomen, a thatcher, and I’ve even spent a day flying raptors in Northamptonshire. Along with Alcott and Tolkien I would include Rosemary Sutcliffe (Sword at Sunset), Jack Whyte (The Camulod Chronicles), and Bernard Cornwell (The Saxon Tales). Their novels set in pre-Conquest England utterly captivated me and made me want to write about that period in England’s history. I go for a walk. Usually it only takes a brief trip around the block to find whatever I’m looking for. 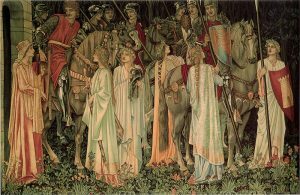 One of the Pre-Raphaelite Tapestries, ‘The Arming & Departure of the Knights’, is a favourite for many reasons. 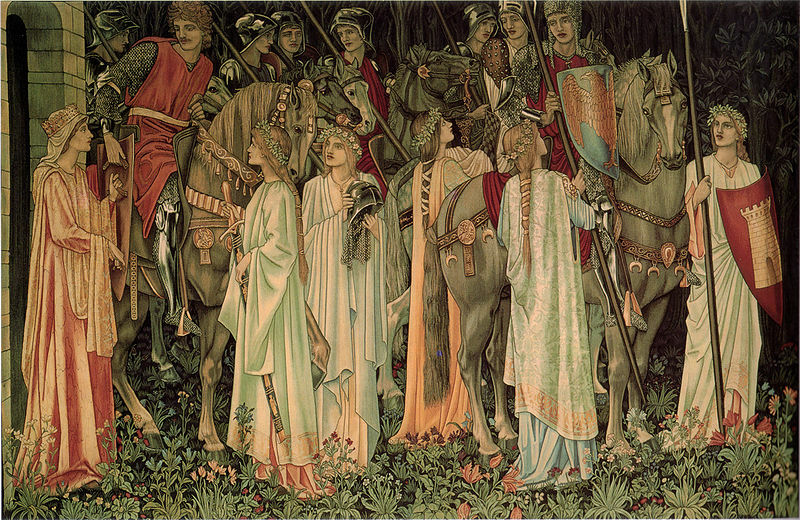 First, I have long been a fan of its designers, Edward Burne-Jones and William Morris. Second, it portrays a scene from the legend of King Arthur, and that is a story that I have always loved. Finally, I see Anglo-Saxon overtones in the details of the garments and the weapons, and in the blonde hair of the figures represented. It is romanticized, to be sure, but there is a bittersweet quality to it because we know that there is a sad ending to this tale, and that gives it the elegiac quality of Old English poetry. Write about whatever you are passionate about, and do not give up! Producing a book is a long, hard slog that takes talent, patience, persistence, luck and time. I’m now researching the third book of my Emma of Normandy Trilogy. I’ve been advised that the third book in a trilogy must be absolutely fantastic, so that’s what I’m aiming for. The book will cover another six very perilous years in Emma’s life. 1006 AD. Queen Emma, the Norman bride of England’s King Æthelred, has given birth to a son. Now her place as second wife to the king is safe and Edward marked as heir to the throne. But the royal bed is a cold place and the court a setting for betrayal and violence, as the ageing king struggles to retain his power over the realm. Emma can trust no one, not even the king’s eldest son Athelstan, the man she truly loves. Elsewhere Viking threats to the crown are gaining strength, and in the north the powerful nobleman Ælfhelm is striking an alliance with the Danes. His seductive daughter Elgiva, former mistress to the king, is forced to act as a pawn in his plan, and is given as wife to a Viking Lord. Can King Æthelred finally listen to Athelstan, whose plan to strengthen the kingdoms’ ties will put off the Viking threat once and for all? Emma must protect her only child without abandoning her noble position. And her inner conflict, between maternal instinct and royal duty, will be played out against the dramatic and bloody struggle for Britain’s rule. “Vividly written, The Price of Blood offers readers something different: a rarely explored era of dark superstitions, where one woman must seize power the only way she can.” – C.W. Gortner, author of The Queen’s Vow. Many thanks Patricia. Best of luck with sales in Australia. I’m so glad that you’re wonderful books are now available here. For those interested in winning copies of both Shadow on the Crown and The Price of Blood, remember to leave a comment. Entries close 13 March 2015. Open to Australian and New Zealand readers. Feel free to share this interview. Here’s a tweet you could use.